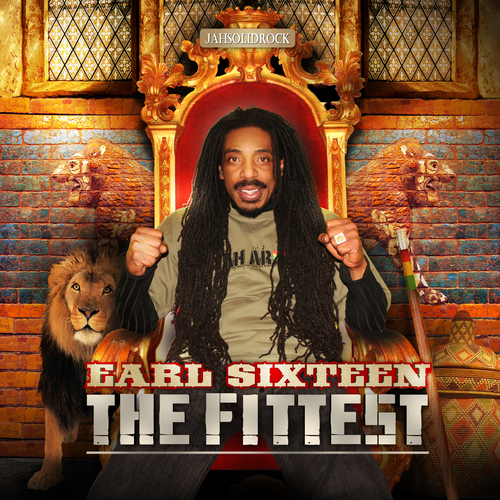 Legendary Jamaican singer Earl Sixteen proudly presents his new album 'The Fittest'. This album is a happy creation, where a Jamaican reggae giant who always kept up the originality and thirst for quality found connection with the Holland based roots reggae lovers of JahSolidRock Music and Not Easy At All Productions. (Amsterdam - April 2011). Earl Sixteen is one of those unique voices that came from that tiny but powerful island in the Caribbean: Jamaica. His voice has the power of soul and is spiritual at the same time. He is a versatile singer and his crying, almost pleading, voice is emotional and suits a broad range of riddims.The works of Earl contains some of the reggae-anthems of all times, with a song like “Freedom” with the great Lee Perry and a breathtaking track called “The Peacefull Rastaman” with the late Augustus Pablo. Earl Sixteen has been in the music industry since the 70’s and has worked with the crème de la crème of producers in both Jamaica and Europe. In the 70’s and 80’s he worked with famous producers such as Lee Perry, Linval Thompson, Augustus Pablo, Coxsone Dodd and Mikey Dread. With the latter, Earl made the brilliant album “Reggae Sound”, originally put out in 1981 and recently re-released. But Earl Sixteen always kept working and is a musical survivor without losing his grip on consciousness. Truly “the fittest of the fittest”. An artists that listens to lots of different music but kept his own style. Last year a first and fruitful cooperation with the JahSolidRock label and producers Not Easy At All resulted in the track ‘Fittest of the Fittest’ on the Collie Weed riddim, which was also released on a sold out vintage vinyl. This collaboration asked for more and the posse in Amsterdam worked to create more tunes for Earl Sixteen, which inspired the singer as he explained “to write deeper tunes”. This now results in a brand new album that blends the original roots reggae vocal vibes of Earl Sixteen with the vivid fresh music and sound quality of which JahSolidRock and Not Easy At All made their trademark - and which is being noted more and more around the world . Tunes like Big Car, Modern Slavery ,Stay Together, Perilous Times and This ya Business, featuring the legendary U Roy, will not only bless your ears. These tracks are both referring to the golden reggae period of the seventies, as talking of the issues of the 21th century and sounding modern. Another trademark of Not Easy At All and JahSolidRock is to prolong every song with a dub version. This fits perfectly with the reggae tradition in which Earl 16 is also rooted. Earl Sixteen announced he will put a lot of effort into promoting this album by touring and releasing singles. So stay tuned, check it out and spread the word! "A perfect fit for Earl Sixteen"